That Jakarta is a chaotic city, everyone already knows. Traffic everywhere and endless motorcycles make anyone’s routine faster and more stressful. 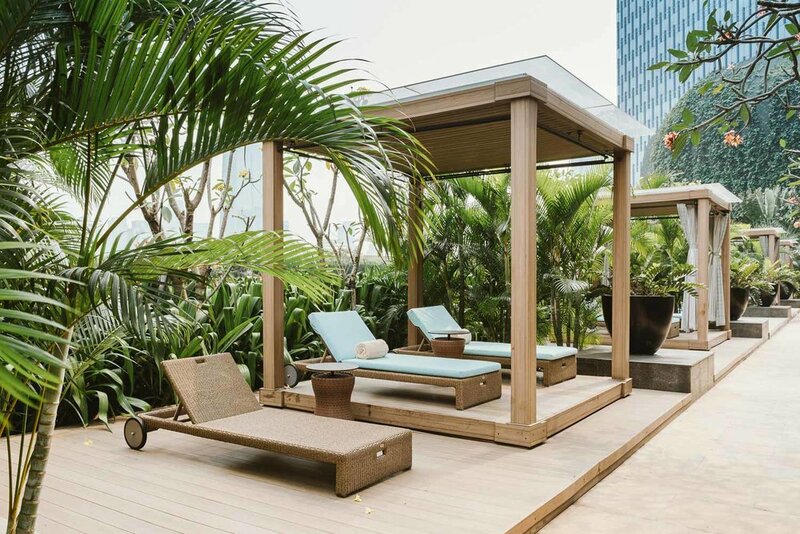 To help you relax your body and mind, a staycation is an excellent choice, being one of them the Raffles Jakarta. The hotel is located in Kuningan, the city’s commercial and diplomatic district, and even in a super busy area, it maintains a cozy atmosphere, which will give you the feeling of being away from the hubbub of the metropolis, and still offers views of the capital's skyline. The hotel has 173 rooms, many with the essential factor for hotels in big cities: large floor-to-ceiling windows that will allow you to see the city's buildings and the illumination of it at night. The bathroom is made of light marble and features a soaking tub, amenities from Parsley and bathrobes made of cotton and batik (an Indonesian dyeing technique) signed by designer Oscar Lawalata. In addition, you will find a comfortable sofa for relaxing and office with TV (ideal for those traveling on business and need to attend meetings). For dining, Raffles offers the Arts Café, which serves breakfast, lunch, dinner and Sunday brunch - there you can enjoy the buffet or choose from the à la carte menu; Writer's Bar (very famous in Singapore's Raffles) which is strong for its gin drinks - including a cart dedicate to offer different combinations of the drink - and where afternoon tea is served; and the pool bar, called Navina, where you can order juices, drinks and sandwiches while taking a dip. And speaking of the pool, the Raffles Jakarta has a 25-meter swimming pool, surrounded by palm trees, frangipani, several sun loungers and 4 more isolated huts for a quieter rest. But if the pool water is chilled, go to the hidden whirlpool to warm up and enjoy the water jets. Next to the pool is the fitness center, with basic yet new appliances. The view from there is something that will give you a greater incentive to sweat. In addition, they offer water, dry towels and some icy towels so you can refresh after exercise. The hotel's spa has 6 treatment rooms, a steam room, an ice fountain, an experience shower and a heated lounger for relaxation and stress relief. I tried the couples massage which was exceptional. On arrival at the spa you receive a jamu (Indonesian elixir) of saffron and ginger to sip as you fill out the form; then you will have a scalp-foot for cleansing and exfoliation; in the sequence, 75 minutes of massage await you, focusing mainly on the parts that you marked in the form; after the massage the treatment goes into a bubble bath with oils and petals; and to top it off you will receive tea with oatmeal cookies as you prepare to go out and get to know the other spa facilities I mentioned above. After a stay at the Raffles Jakarta, tell me if you will not start the week in the city much more relaxed.